Now before I’m berated for dissing over-sized polo shirts, polyester pants or large vinyl totes, let me say that no one in the group had anything against the woman in the poster. What we unanimously objected to was yet another patronizing example of stereotyping and the resultant marginalization of seniors by a society that “worships a youth we all lose”. So what’s this got to do with bicycles? I was asked to write about my travels on a Bike Friday, but after looking over my ADD-inducing site, I declined. I am but one of 20,000+ Bike Friday customers doing the same. Plus there’s an increasing trend towards “traveling in your own back yard”, with the bicycle evolving accordingly – witness the rise of the extracycle or cargo bicycle, and bicycle commuting in general. Nor am I going to underestimate your eco-awareness and beat the “how green is my folder” drum I’ve been beating ever since the release of the tikit. It goes without saying that if a regular bicycle can save you gas, time, gym fees and the planet, a portable bicycle must do it in spades. Instead, I want to talk about a mundane, seldom mentioned, yet utterly futuristic feature of many of today’s folding bikes: low stepover. Low stepover means, you can get on a bike more easily. Your can get your leg over it, so to speak. Your granny can get her leg over it, bless her. Your great, great granny can too, even if the other one is in the grave. Low stepover makes a bicycle “human scale”, accessible to all riders great and small, young and chronologically old. In this way, you can ride it from Sesame Street right up to that great rest stop in the sky, long after your beloved Pinarello has become a hand-me-down. Low stepover gives a rider psychological assurance that they can easily make contact with the ground if things get a bit exciting. Fortunately, the increasing number of folding bikes popping up in bike shop windows and our burgeoning dealer network seems to signal a change to the attitude “they’re not real bikes”. Change. Perhaps someone has spotted Obama tooling around Chicago on a folder and blogged about it? “Old fuddy duddies ride folding bikes,” I was told by one bike shop. “The beauty about being a senior is that you’ve reached an age where you don’t care about being Lance anymore,” said one customer. “You want something that works, that keeps you fit, that you can ride with you kids and grandkids.” And that if you so desire, you can ride the perimeters of countries and win gold medals with. Frank Pierson, 83, World Senior Games. Who hasn’t seen a kid straining to ride a bike that is too big, because the average parent doesn’t want to be investing in bicycles as well as new socks and school uniforms every year? Who’s shuddered at seeing a tiny tot perched precariously atop a full-sized tandem, unable to easily reach terra firma if they wanted to – and all kids want to. A low stepover bicycle is kid-friendly by design and should ideally adjust to take them all the way from pram to prom night. When kids can place their foot on a bar and deal with a wheel that’s closer to their head size, it makes for a less threatening experience. I guess this is just a category of “bigger kid” and I’m a card-carrying life member. The height of the average American woman is reported to be around 5’4″, and for a Chinese, of which there are a few billion potential cyclists, around 5’zip. Yes, there are “women’s specific bikes”, offering careful gal-geometry, smaller front wheels, scaled down components. But you can only do so much with wheels of a certain size. Small wheels afford so much more flexibility with frame sizing. “It’s a no brainer,” says Irv Housinger, an early Bike Friday adopter and co-designer. If you’re truly Lilliputian, a low stepover bicycle is the only bicycle you can ride. For years, Little People have lamented being stuck with crummy, ungeared kid’s bikes “with Disney graphics all over them”. A multitude of physical problems often come with the gene, making exercise crucial to avoid obesity, but difficult by conventional means. What they need is a bicycle built for kids – but fitted for a grown-up. I have achondroplastic dwarfism and am 47 inches tall with a 16 inch inseam. Last weekend, I participated in the 2006 Chicago Bike the Drive 30 mile ride. It was a very enjoyable ride and I was able to complete it in the allotted time, something I would not have thought possible a few years ago. Achondroplasic dwarf Dan Okenfuss, rides his folding road bike to and from his office in Sacramento. “I wanted a bike to keep up with my 6’4″ brother Chuck on the 115-mile El Tour de Tucson,” he said. So you’re neither a senior, a junior, a small ride or a dwarf. What does all this mean to you? You will not be Forever 21. You might need to stop laughing at small wheels and start learning something from those fuddy-duddy, low stepover, folding bikers. The more we ride a bicycle, the more we benefit ourselves, our families, the health system and our planet. And the longer we can do so, the less bingo we will play, the sharper our minds and more respect we will gain from the younger generation, including folks who manufacture posters about Seniors Week – and those vinyl totes and polyester slacks. The Galfromdownunder admits to having a twisted view of seniors after been surrounded by adventurettes like 70-something Margaret Day, who rode across Australia’s Nullabor Desert on her Bike Friday. Yup, that’s how she’d probably like to be depicted in that poster. This entry was posted in Bicycle Touring Pro Articles, Bicycles, Main Articles, Products and tagged austria bike, bike friday, bikes for short people, folding bicycls, gal from down under, little people bicycle, low step over, peitite bicycle riders, portable bicycles, senior citizen bicycles, senior day, short bikes. 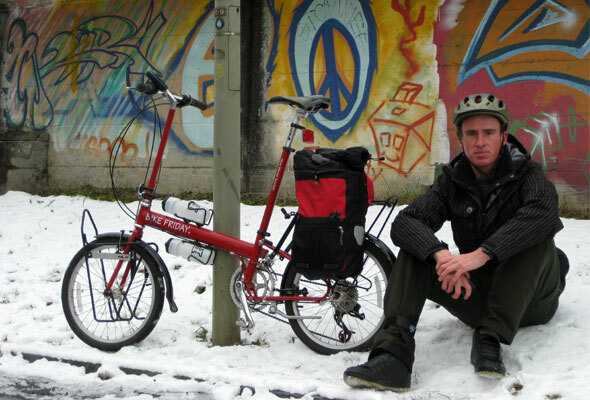 The folding bikes have there place” ‘ we used them for 3 years while living the sailing life. ” These bikes take up smaller space on board already tight quarters and allowed us to travel the port towns for sight seeing and re-supply. The bad side to these bikes in my opinion is two fold. “First is the smaller wheels, they ride like crap when loaded with a rider and groceries and have a very hard time tracking and going through any kind of loose turf like sand, gravel and you really feel the bumpy roads. The second downside to me is the take down and packing for shipping…it’s a PITA especially if you do it often. We don’t live on board a sailing vessel anymore but ship our bikes all over the place…we find that using 26” rigid Mountain bikes with cable and S&S frame couplers solves the storage, packing, shipping and ride problems. Modern rigid frame Mountain bikes can have very low stand over height and quite frankly are better suited for long rides on more diverse terrain than any of the smaller folding bikes plus can handle the real rough stuff where the smaller folders have no chance…just my two cents from past and present experience. You don’t have to be a senior to appreciate the low stepover. We bought some Bike Friday folders this last summer to tour on and that turned out to be one of my favorite features. While touring you sometimes have to get off the road and stop quickly, plus kicking your leg up over a big stack of tent and sleeping bag etc. gets old after a while. I’m finding that and the quick turning to be nice around town also. I purchased my 1st folder in 1994, a Bike Friday Pocket Rocket. It remains my favorite bike. If I could only keep one bike, it would be the one. 1. I does drop into small holes in the pavement more easily than a larger wheel. 2. It weighs a little more than the newest carbon fiber wonders, but most people could lose 2 # of body weight and make up the difference. 3. Tires wear out faster; 2/3 the size, 1/3 less life. 1. Quick fold and toss it in the car in 20 seconds. 2. Never worry about it being stolen off the roof rack or collecting bugs, grit, dirt, rain on the roof, plus dropping your gas mileage on a trip. 3. Take it by air in the normal case with no special cost or provisions, just like standard luggage. 4. As Lynette noted, stand-over matters; it’s a plus. 5. It’s a conversation starter when touring; anywhere — any country. 6. My trailer converts to be a utility trailer; but I can do the same with a conventional bike. 7. If you fit it correctly, the touch-points are identical to any other bike. 9. The convenience of bringing your own bike eliminates finding a bike at the other end of a trip, suffering poor fit, and the time hassle of picking it up and taking it back. 10. Ideal for touring and road riding; perhaps a bit worse that a big tire bike for off-road riding. I seem to have a lot more positives than negatives. In the end, all manners of convenience means that you are likely to ride, be healthier, be happier, and perhaps save some money. What’s not to like about that. We’re car-free and use our Bike Fridays to do the supermarket shop (with capacious panniers), visit friends, cycle the lanes, go to the pub, and tour with our tent, in the UK and abroad. As Greg Graham says, the low step over is ideal when the back rack is piled high with stuff. The folding comes in handy if there’s not much space on the train too, but often we don’t need to fold them because they are so small, they fit where a bigger wheeled bike wouldn’t. The kids in our area relate to Bike Fridays too because of the small wheels, I think. They see adults on BMX-sized bikes and can see that cycles have potential for transport. So we hope we’re doing our little bit to divert ambition from car ownership to bike ownership. Older people stop and talk to us when we’re in town shopping, describing the folders (often still called ‘shoppers’ after the first Moulton) they use because the low step-through is no problem for their arthritic hips. Folders are already the cars of today – here’s to a cycling future! I have seen the folding bikes, in resort towns. My idea was these bikes are for people with yachts, or land yachts (RV’s etc.). And then, I got one! The “low step-over” is more important than you say, here. It is essential to having an enjoyable bike ride, for me. I like being able to put both feet down, step off, walk alongside the bike (the folding pedal doesn’t hit me). I like that pace of things. I like to actually see the beautiful view, and not zoom past it at speed. I like to participate in the scenery. I see geese landed ahead. I want to walk up, sit down, and be with them for awhile. The main deterrent for actually using any bicycle I have owned, is worry about theft. I like the coffee shops. I like outdoor cafes. I just hate worrying about theft of my beautiful, and expensive, bicycle. However, that problem is removed. The folding bicycle is so rather “odd” and so many thieves are just not interested, and, if I feel the least bit insecure about being away from my bicycle, it folds and I bring it inside. I can even put it in it’s bag, so there is no objection whatsoever about dirty tires on the floor. 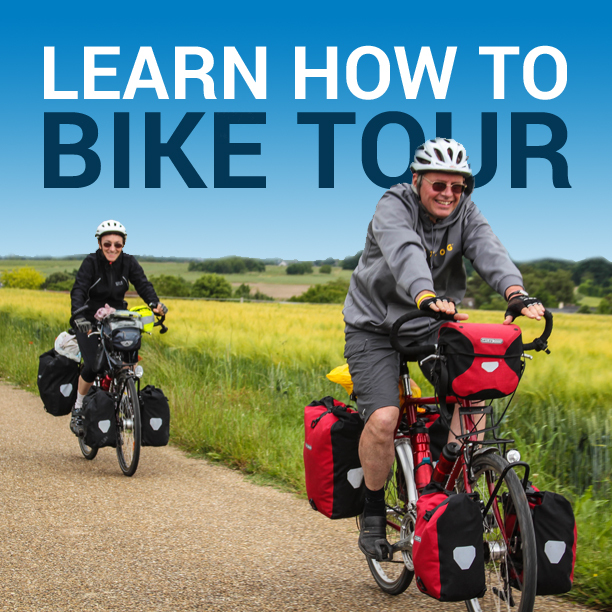 The Bike Friday website has shown me people actually tour on their folding bicycles. I might even do that. By the way, your website is very motivational. I look at your experiences and I say, I could do that.